A beautiful Grade II listed Georgian cottage in the heart of Bakewell. Perfectly situated in a quiet location opposite Bakewell's All Saints Church, yet within 2 minutes walk from the centre of the town with all its amenities including cafes, pubs, restaurants and independent retail shops. 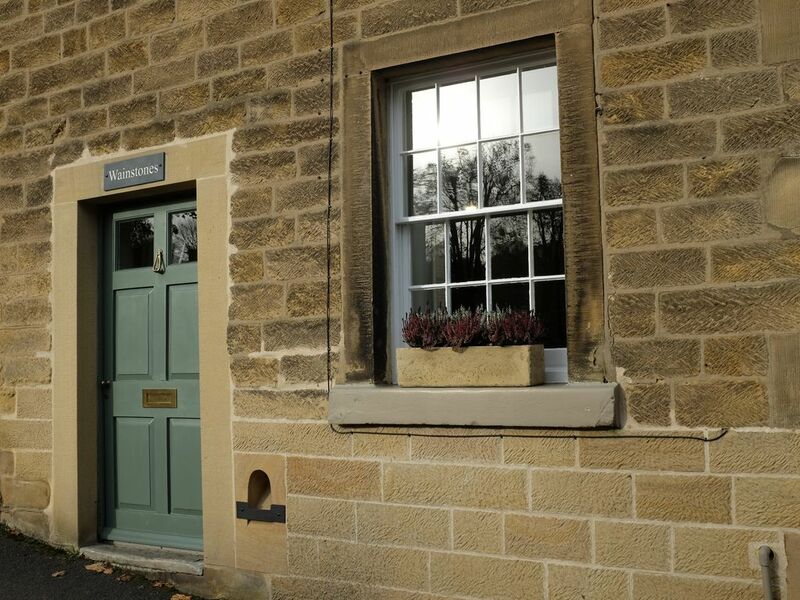 Wainstones has been recently renovated and now boasts a perfect balance of Georgian charm with modern convenience. The cottage is ideal for couples or families of up to 4. Provision can be made for 5, but please note that an additional nightly fee applies. Ideally located in Bakewell, it is within easy reach of Chatsworth House, Haddon Hall and all the Peak District has to offer, and Bakewell is exceptionally well served by local public transport. The cottage is fully centrally heated but also benefits from the convenience of remote controlled traditional Esse cast iron gas stoves in both the lounge and the kitchen. A perfect haven for relaxation at the end of the day. Generous weekly discounts apply. Discounts are also offered for mid week breaks for a couple. Ground floor – South facing sitting room with views of the churchyard with a 3 seat and a 2 seat sofa, 40” flat screen TV, DVD and remote controlled gas Esse stove. Fully fitted shaker style kitchen with oak dining table and seating for 5, fridge freezer, microwave, electric oven with gas hob and extractor fan, integrated washing machine and dishwasher. The kitchen also benefits from a remote controlled gas Esse stove. First floor – Steep steps to first floor comprising south facing bedroom with double bed, chest of drawers and wardrobe, a small bedroom with single bed, bedside cabinet and under bed storage, and the bathroom with wash basin, WC, bath with shower over and illuminated mirror with integrated shaver/toothbrush sockets. Second floor – Steps lead to a large dual aspect room with restricted height below the eaves. Twin beds with chest of drawers, wardrobe and seating area with 32” flat screen TV and DVD and electric stove. Outside – Small rear courtyard garden (accessed via a passage way) with seating and retractable washing line. The property benefits from full gas central heating and free WiFi. Gas, electricity, linen and towels included. A travel cot and high chair can be made available on request. Parking on street by residents parking permit (included for one car). Bakewell is at the hub of an excellent bus network which reaches into most of the Peak Park. It may be possible to arrange transport for guests and bicycles (by the owner) to and from local transport terminals (e.g., Chesterfield railway station, Matlock railway station) – please ask. I'm happily married to Kay and we have two teenage daughters. I've spent the last year or so renovating Wainstones. Before that I worked for a large corporation where I provided programme management. We live in Over Haddon (a small village) near to Bakewell, and absolutely adore the Peak District where we have lived for the last 16 years or so. Because it's right in the heart of a beautiful small market town - Bakewell. It is a great location for exploring the Peak District. You don't even need a car, as the bus network allows you to explore the Peak District. After a hard day's walking or sightseeing, come home to the cosy cottage, which has everything you need for a relaxing and comfortable stay. A stone's throw from Bakewell, yet very quiet. Central heating throughout, and cast iron gas stoves ensure that you have a cosy welcoming stay. The property has been renovated to a high standard, but retains the old world charm of a Georgian townhouse. Gas fired central heating throughout the property plus Esse gas stoves in both the living room and kitchen. There is a stone fireplace in the living room, and the kitchen has a brick lined fireplace. Both have Remote controlled Esse gas stoves. Residents' parking permit provided for one car. The property benefits from free internet and wi-fi. The living room is south facing and has a 2 and 3 person sofa, and a 40 inch smart TV and DVD player. It has a stone fireplace with Esse gas stove. Kitchen includes hob, oven, fridge/freezer, washing machine, dishwasher, microwave, toaster, kettle and remote controlled Esse gas stove. The dining area is in the kitchen where an oak dining table and seating for 5 is provided. The kitchen/dining area has kick space central heating, and a remote controlled Esse gas stove. 40 inch smart TV and DVD player in the living room. 32 inch smart TV and DVD player in the attic bedroom. DVD player in the living room and attic bedroom. Extensive range of adult and children's DVDs are provided. A few board games and packs of playing cards are provided. There is a small enclosed garden patio area with seating for 5, which has a retractable washing line. Parking: Parking in the vicinity of the cottage is by residents parking permit. A single permit is provided for the duration of the stay (free of charge). Great little cottage, centrally located for the village of Bakewell and easy driving distance to other local attractions. Very well equipped, clean and modern. Hope to be back! Another fantastic New Year in this great cottage. It's our third time so that tells you how good it is. The cottage is superbly equipped with everything you can think of and would need. Bakewell itself is a lovely town with lots of great shops and places to eat. It is also close to the Monsal Trail so lots of great walks on the doorstep. Chris is the perfect host and is easily contactable if you need anything. We had the pleasure of staying at Wainstone's over Christmas. The cottage was extremely cosy, and it had been decorated for the festive period which was lovely. Our teenage girls shared the twin bedroom at the top which is a great space with its own little TV and chairs. We found everything we needed in terms of kitchen equipment and made good use of the walking books! It was great to be able to do walks right from the door of the cottage. The beds were extremely comfortable too. The only slight draw back was the lack of parking outside the cottage but wasn't a major problem as we always found somewhere just up the street. However the central location of the cottage in Bakewell was great as it was only a few minutes walk to the shops and pubs! We loved this cottage and would definitely stay again. Family of 4 stayed for 3 nights. This cottage was exceptional. It was spotlessly clean and lovely and cosy, perfect for family evenings by the fire following 2 days of walking. Wainstones had every essential that a home away from home would need. The welcome pack including biscuits and beer was greatly appreciated. The attic bedroom was a complete hit with our teenagers! Bakewell is a brilliant base for walking, which meant we did not need to drive anywhere for 3 days. We hope to return to this beautiful cottage at some point in the future. The cottage is perfect - comfortable, clean and with everything you could wish for for a lovely break. All mod cons and all set up to be so easy to use. The house is very well appointed throughout, but be aware of a steep staircase needing care and attention! The location is perfect to walk into Bakewell where there are plenty of things to see and do and several good pubs and a couple of excellent restaurants. The town is very busy (especially at weekends and on Monday market day) but we had no problems finding residents parking spaces (with the permit supplied) and could relax. Great walks nearby and lots of wonderful places to visit around the Peak District. Haddon Hall and Chatsworth on the doorstep virtually and wonderful Hardwick Hall a 40 minute drive away. Too many others to mention! This is definitely a place to come and stay and really make the most of a great area from a perfect base. A beautiful, homely cottage conveniently situated on a quiet road just a few steps from Bakewell village centre. Everything you could possibly need is to be found in the cottage and the owners provide clear, written instructions on how to work all appliances. We particularly enjoyed the Esse gas stove in the lounge, which looked just like a wood burning stove but was much easier to deal with. Very cosy on a chilly evening! The booking process, key pickup and resident parking permit all worked seamlessly. The owners left a lovely welcome pack of wine, biscuits, milk, tea and coffee, which was much appreciated after our drive. It's only a small thing but this was the first time we've ever been self-catering and haven't had to go out to buy washing-up liquid and salt! The stairs are quite steep and narrow, which may be a challenge for some elderly guests but other than that, I wouldn't hesitate to recommend this property.